The past week has been a chaotic one. Last Sunday, my brother Joel was found in his apartment by his fiance, mostly unresponsive after he suffered from multiple seizures in what doctors think was a 24-hour period. He was rushed to the hospital, put into the Intensive Care Unit and then the acute care unit, where he has remained for the past week. Thankfully, he is still with us today. His doctors say he is extremely fortunate, considering his kidneys and liver nearly failed, which would have resulted in a scary fate for my brother. The Lord was watching over him and spared his life, and for that we are incredibly thankful. However, Joel’s battle is not finished. On his road to recovery, his memory has been greatly affected. His short-term memory needs much improvement, and he needs constant reminding of things that he used to know and recall with ease. This is such a hard pill to swallow for both Joel and my family. Imagine seeing a family member struggle to remember your name or have no idea what you did together just a week ago. It has been extremely taxing and a period of trial for all involved. This is when the Lord led me to an article by Joni Eareckson Tada. Tada is one of my favorite childhood author/illustrators. 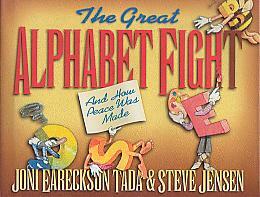 One of my favorite books throughout my childhood was “The Great Alphabet Fight,” by Tada and Steve Jensen. I specifically remembering marveling at the illustrations and letting my young mind soar with imagination as I flipped through the pages of the book. My mom shared with me that the person who drew these pictures did it with their mouth. “What! ?” was my appropriate response. She explained that the woman who illustrated this book had been in a swimming accident that broke her neck, leaving her unable to use her hands, so she learned how to draw by holding pens and pencils with her teeth. She also explained that through that process, she became a great woman of faith, sharing her story with millions of people. Enter today, where I’m scrolling through my Facebook newsfeed, as I often do, to find inspiration for “Millennial Monday” content. I see an article titled, “Reflections on the 50 Year Anniversary of My Diving Accident.” I knew immediately that this must be an article by Tada. Oh how I needed this article after the events of the past week. Tada discussed how the past 50 years of her life have not been easy ones and what she has learned in those times. Her wisdom resonated with me, as my brother Joel and my family are in the midst of an unexpected, tragic event. Tada said, “It sounds incredible, but I really would rather be in this wheelchair knowing Jesus as I do than be on my feet without him.” That is a hard statement to grasp. It made me ask the question to myself, “Would I rather be handicapped with Jesus, than completely healthy without Jesus?” My answer is a resounding yes. As my brother has struggled to regain conscience, kidney and liver function and basic functions we take for granted, I couldn’t help but wonder how on earth he or my family could get through this time of trial without the Lord guiding us and offering hope in a dark and scary situation? Our family has received an outpouring of prayer and love from our fellow brothers and sisters in Christ. Doctors have remarked that they have seen people die from lesser causes than my brother’s. They have said his quick progress is remarkable and unexpected. But I know why Joel has exceeded expectations — because we have the Lord on our side. When we hurt, suffer and experience pain on this earth, it causes us to get down to the basics of who we are and what we believe. Tada said in her article, “It was good for me to be afflicted so that I might learn your decrees” (Ps. 119:71). I won’t rehearse all of suffering’s benefits here. Many of you know them by heart. Like the way God uses suffering to shape Christ’s character in us (Rom. 8:28–29). Or how it produces patience (Rom. 5:4). Or how it refines our faith like gold (1 Pet. 1:7). Or gives us a livelier hope of heaven (James 1:12). And on and on. “However, if I were to nail down suffering’s main purpose, I’d say it’s the textbook that teaches me who I really am,” Tada wrote. Who I am, who the people in my family are, who Joel is, are Christ followers. Without our Father in Heaven, no one knows what the outcome of this tragedy would have been, but we’re thankful that He is the great Healer and Protector of His children.